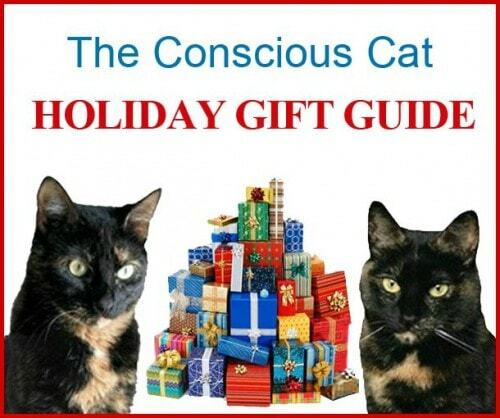 Welcome to The Conscious Cat 2015 Holiday Gift Guide – your one stop shopping solution for all the cats and cat lovers on your holiday gift list! This year’s guide features some of the best products for cats and cat lovers on the market. And even better: many of the companies featured are offering exclusive discounts to Conscious Cat readers! 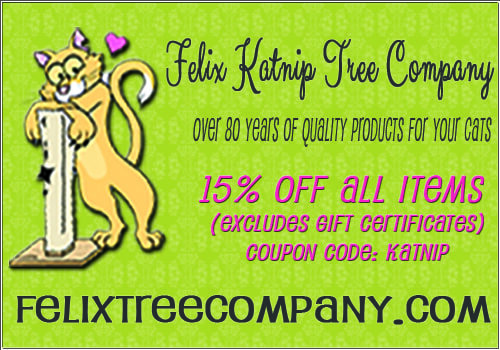 The Felix Katnip Tree Company has been handcrafting cat scratching posts for over 80 years. All of their posts are made with real wood, natural hemp sisal, and certified organic catnip. They have tall posts, short posts, horizontal posts…for all your cat scratching needs, they’ve got you covered. Visit http://www.felixtreecompany.com for more information and to purchase. Exclusive discount for Conscious Cat readers: 15% off all orders from November 1 – December 15, 2015. Use code Katnip at checkout. Discount is not valid on gift certificates or shipping fees. Give your cat lover friend or family member a unique piece of original artwork. 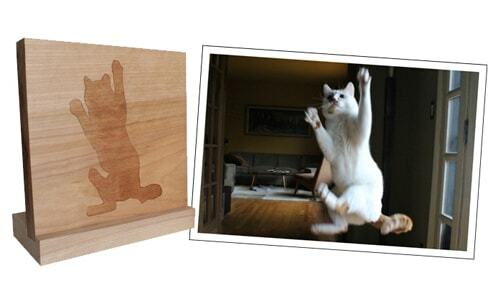 Each Petaggio piece is made of solid birch wood and depicts the cat’s silhouette based on a photograph that you upload. You get to pick the pose that best shows off kitty’s special personality. Keep Petaggio on your desk or on the wall. Please visit http://www.daviesdecor.com for more information and to purchase. Pet Tree Houses are handcrafted from the finest quality real trees, left in their true nature, and embellished with silk foliage to provide a life-like audible and visual experience for your cat. This real cat tree with leaves is designed to focus on your cat’s true nature, bringing out your cat’s primal instincts. This method helps reduce captive stress and encourages your cat to stretch and scratch on the gnarled branches, bark, lichen and all. Not only are they functional for your cat, but they are aesthetically pleasing too. 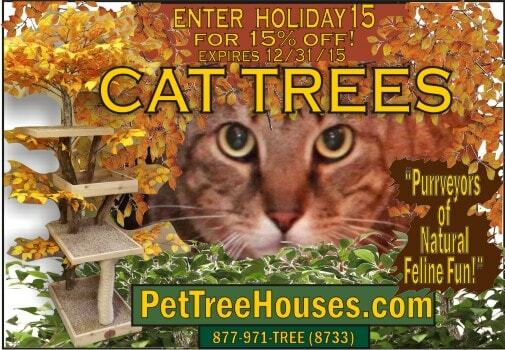 For more information and to purchase, please visit http://www.PetTreeHouses.com or call 877-971-TREE (8733). Exclusive 15% discount for Conscious Cat readers. Enter code HOLIDAY15 at checkout. Expires 12/31/15. The Flitter Fly is an entirely new take on motion cat toys. 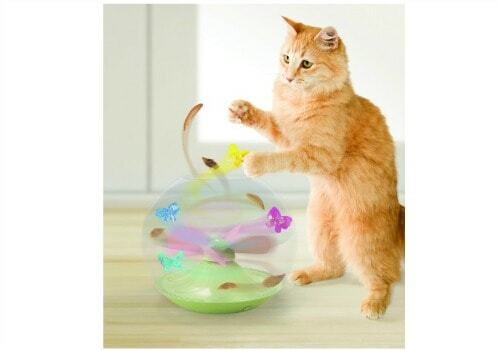 This whirl-and-catch wind toy blows colorful butterflies and lightweight feathers around a clear bowl with a gentle fan that’s safe for cats. Cats delight in poking a paw through the top opening, trying to catch the swirling butterflies. Sporadically a feather will fly out of the bowl, inspiring cats to pounce. The variable speed fan speeds up, slows down and occasionally stops to captivate cats, and the timed auto-shutoff feature helps preserve the life of the included replaceable batteries. For more information about Flitter Fly, please visit http://www.Petlinksystem.com. 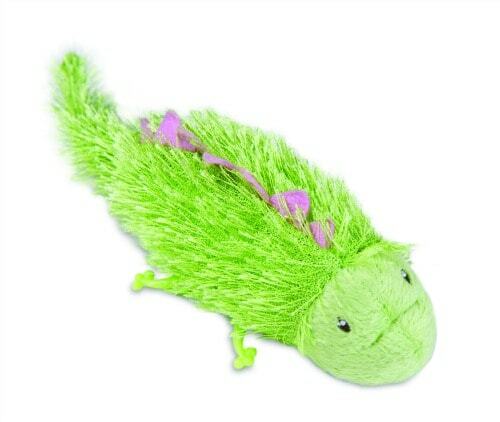 Flitter Fly is also available from Petsmart, Petco and Amazon. SmartyKat has also introduced new electronic toys designed for high-energy daytime play when noise is not an issue. One of their most innovative new motion toys is the Cruzin’ Critter. This lively lizard cruises around on two motorized wheels, while his delightful little legs twirl to create the illusion of crawling. Rendered in soft textured fabrics, the Cruzin’ Critter inspires cats to stalk and chase and comes complete with replaceable batteries. For more information, please visit http://www.SmartyKat.com. The Cruzin’ Critter is available at Walmart, Target, Kmart and Shopko, and from Amazon. Every pet has a different style of sleeping, and Kathy Ireland’s Loved Ones has created a line of luxurious pet beds to address the particular needs of side, belly, back and curled sleepers. The Gracie & Delilah Quilted Pet Bed With Pillow is a cuddler style bed that provides a stylish and cozy place for side, back and curled style sleepers. The 16.5 x 16.5 x 5 inch bed has sides that are covered in luxe faux-leather and the removeable plush pillow is machine washable. For more information, pleas visit http://www.LovedOnesProducts.com. The Kathy Ireland Loved Ones Gracie & Delilah Quilted Pet Bed with Pillow is available from Amazon and at local independent specialty retailers. Sherpa totes are designed to be fashionable while providing a discreet way for furry friends to come along for short trips without attracting attention. The Metropolitan Tote, for pets up to 16 pounds, features a wide top for easy pet entry, four mesh panels for ventilation, a machine washable faux lamb’s wool liner and a padded, adjustable shoulder strap. 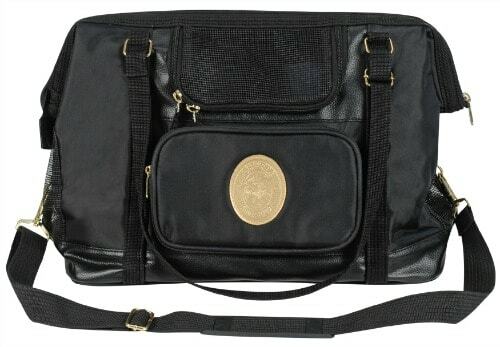 This stylish tote is available in black or navy with metallic accents. The Sherpa Metropolitan Tote is available from Amazon. For more information and to purchase, please visit http://www.UrbanPawPet.com. Exclusive 15% discount for Conscious Cat readers: use code HOLIDAYCAT at checkout. Discount good on all Urban paw products. Discount expires December 1, 2015. 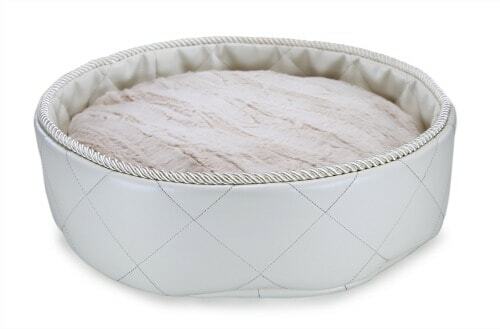 The Cat Ball® cat bed was designed for cats, and styled for humans. 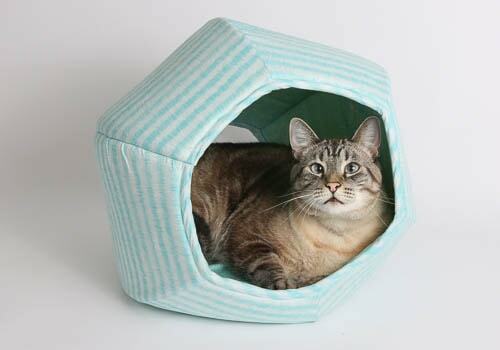 The six sided Cat Ball® cat bed has two openings, one larger than the other, allowing cats to peek out and watch household activity while feeling safe and hidden inside this pod style cat cave bed. Made with soft and flexible materials, the Cat Ball® cat bed weighs just about one pound, is washable and totally flexible. The Cat Ball® cat bed was designed by Jennifer Schmidt, a costume designer, and is manufactured in both Mexico and the USA, in a wide variety of fabrics. Exclusive 10% discount for Conscious Cat readers: use code LoveRuby at checkout. Discount expires December 31, 2015. 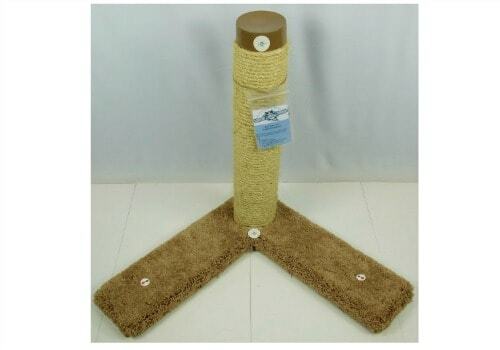 The Sisal Furniture Protector Cat Scratchers by Kool Kitty Toys are patent-pending cat scratchers designed to protect furniture from being damaged as a result of instinctual cat clawing. The scratcher can be positioned under the leg of a chair, couch, table, or other household furniture. 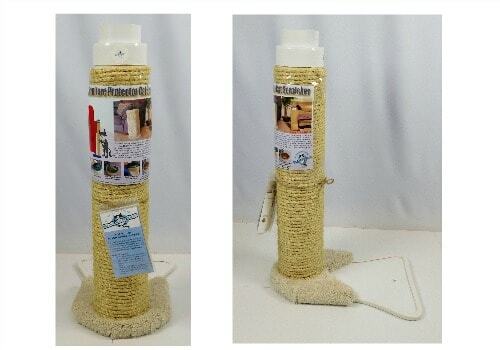 This sisal version offers a special design to attract cats, with a removable lid, allowing you to freely add catnip into the cylinder with unique catnip filter packs to entice your furbaby to the furniture scratcher. As an added bonus, the lid also doubles as a beverage holder. Every scratcher is double bonded with glue and staples. You can choose from a variety of material colors. Other features and options will be considered. For more information and to purchase, please visit http://www.KoolKittyToys.com. 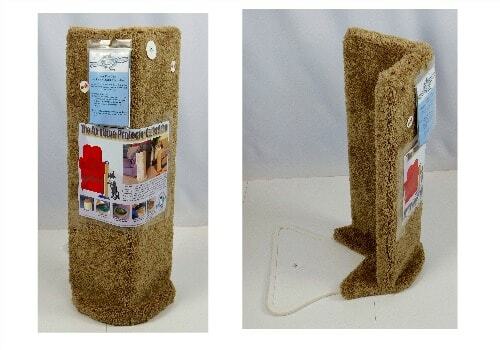 The Carpeted Furniture Protector Cat Scratchers by Kool Kitty Toys are patent-pending cat scratchers designed to protect furniture from being damaged as a result of instinctual cat clawing. The scratcher can be positioned under the leg of a chair, couch, table, or other household furniture. This carpeted version offers a special design and has to pockets of catnip to attract cats to the scratcher. Every scratcher is double bonded with glue and staples. You can choose from a variety of material colors. Other features and options will be considered. The Kool Kitty Space Saver Corner Cat Scratchers is perfect for smaller living spaces. It fits snugly into your kitty’s favorite corner, to provide a scratching area without being in the way. The ends of the carpet are infused with catnip pockets, and the lid of the scratcher is removable, so you can freely add catnip into the cylinder and entice your furbaby to it with any catnip or other scents your cats love. Choose from a variety of material colors. Every scratcher is double bonded with glue and staples. Other features and options will be considered. When the founders of Purrfectplay searched for natural organic cat toys for their little band of felines, all they found were synthetic, brightly colored toys made in China – this worried them. They wondered, could we make better safer cat toys here in the USA? Purrfectplay started in a spare bedroom, on a shoe string budget. They have outgrown their spare bedroom but remain a simple business– dedicated to producing organic durable cat and dog toys– toys your pets will love. Their unique collection of cat toys includes: cat balls, wool toys, and lots of amazing organic catnip toys. Organic natural cat toys really are more fun -just ask your kitties! For more information and to purchase, please visit http://www.Purrfectplay.com. 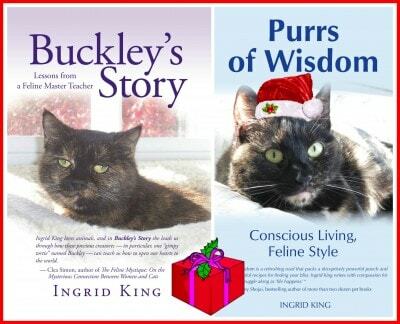 Exclusive 20% discount for Conscious Cat readers: use coupon code Conscious Holiday 2015 at checkout. Discount expires December 31, 2015. Peach Pillow Beds are the coziest spot for your cat to curl up this winter. Available in 4 sizes and 14 beautiful fabrics, each extra plush bed features a machine washable cotton cover and a self-contained, channeled, eco-friendly pillow insert. 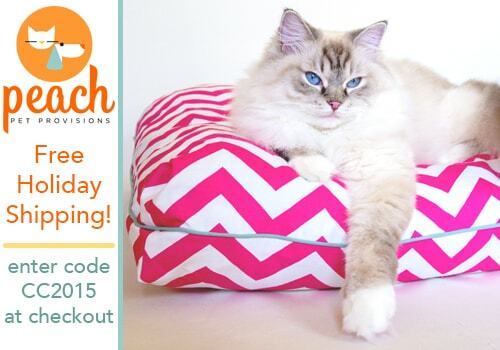 And, like all Peach Pet Provisions products, Peach Pillow Beds are 100% made and sourced in the USA. For more information and to purchase, please visit http://www.PeachPetProvisions.com. Free shipping for Conscious Cat readers – use code CC2015 at checkout. Offer good November 1 through December 31, 2015. The Sleepypod is three products in one: a carrier, a pet bed, and a safe car seat. Ultra plush bedding surrounded by a luggage-grade, ballistic nylon base forms the bed that easily becomes a carrier by simply zipping on its mesh dome. In a car, the crash-tested Sleepypod becomes a safe car seat. On the road and at your destination away from home, a pet remains in its own bed through the entire journey. 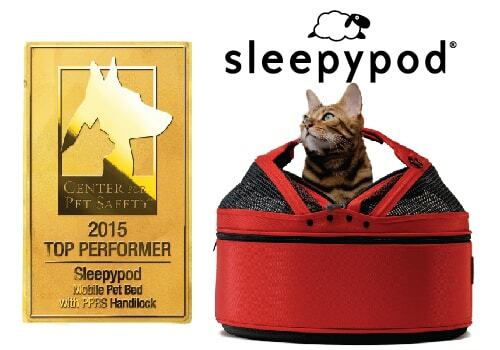 Sleepypod mobile pet bed with PPRS Handilock was named a Top Performing Pet Carrier in a Subaru of America, Inc. and Center for Pet Safety (CPS) collaborative study to test the effectiveness of pet carriers and crates in crash situations. For more information and to purchase, please visit http://www.Sleepypod.com. Exclusive 10% discount for Conscious Cat readers: use code 10CC2015 at checkout. Good on orders over $100, expires December 31, 2015. MyThreeCats.com is your one stop destination for products enhancing your cat’s active lifestyle! Their quality selection of cat furniture and cat toys are all cat tested (after all, they know best) before they reach your door. Then there is you – the consummate cat lover! Shop their great selection of Laurel Burch designed handbags, jewelry, nightshirts, and other fine gifts to please you and those other cat fanatics on your gift list. 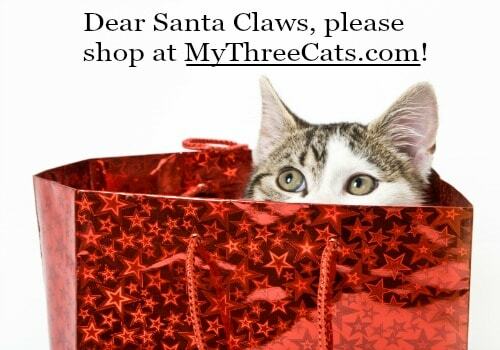 Discover why thousands of customers make MyThreeCats.com their cat shop of choice. For more information and to purchase, please visit http://www.MyThreeCats.com. The U J I Tunnel System with its three unique interlocking shapes can make over 20 different configurations to keep cats fully engaged and can accommodate different size rooms and play areas. It features high quality plush material with soft lining and is durable with added cat friendly safety features. It comes with a compact stylish carry bag for easy storage and travel. Use with wand toys to enhance your interactive playtime! For more information and to purchase, visit http://www.Nekoflies.com. Exclusive 10% discount for Conscious Cat readers on any tunnel purchase. Use code conscat2015 at checkout. Discount valid November 1 through 8, 2015. This is a pre-order item, delivery will be in early December. Discount available for US readers only. 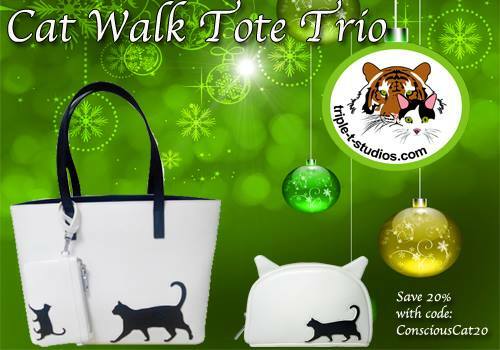 The Cat Walk Tote Trio, designed by Triple T Studios, features a happy cat walking with tail up and curled and a whimsical trail of cat paws creating a pretty pattern across the back of the bags. The cat and the cat paws are carefully stitched in place on the vegan friendly material with a softer hand-feel sure to make you purr. The Cat Walk Tote has a hidden magnetic snap closure for a more streamlined look with black trim inside the top with black shoulder straps. The Cat Walk Cosmetic Bag features cute cat ears and the Cat Walk Phone Cross-Body Bag comes with both a detachable wrist strap and a generous cross-body strap. For more information and to purchase, please visit http://www.Triple-T-Studios.com. Exclusive 20% discount for Conscious Cat readers: use code ConsciousCat20 at checkout. Discount expires January 31, 2016. 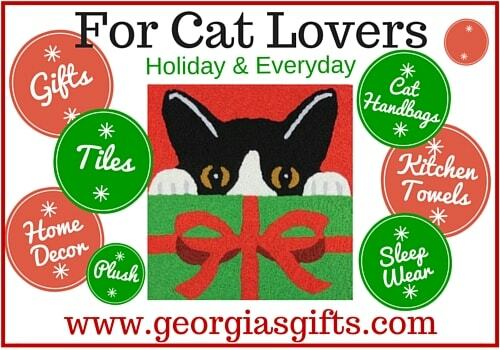 Georgia’s Gifts offers a wonderful and varied selection of cat themed gifts, decor and fashion accessories. For in home decor, they offer unique items such as cat pillows, accent rugs, frames, kitchen linens and ceramic tiles. Their garden selection includes flags and mailbox covers. In addition to figurines and plush sleepwear, slippers, socks and other whimsical cat items, they feature the popular Laurel Burch cat handbags, scarves and mugs. You’ll be sure to find that “purr-fect” gift you’ve been searching for. Exclusive 10% discount for Conscious Cat readers: Use promo code CCHG10 at checkout. Offer good through December 10, 2015 (cannot be combined with other offers). Minimum order $10.00. 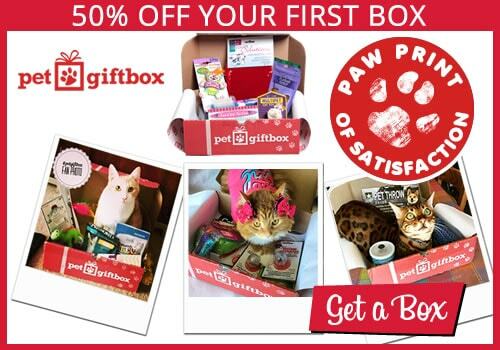 PetGiftBox.com is a monthly subscription-based service that sends a box of hand-selected treats and toys specifically created for cats and dogs. Each and every month your box arrives with a surprise theme. PetGiftBox.com cares about their customers and pet best friends and are constantly working to bring them the best. For more information and to purchase, please visit http://www.PetGiftBox.com. Exclusive discount for Conscious Cat readers: get 50% off your first box. Use code consciouscat cat checkout. Discount expires January 31, 2016. 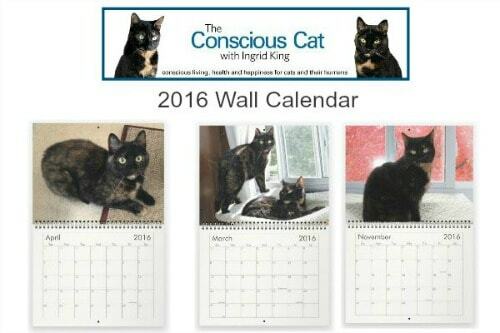 It’s back by popular demand: The 2016 Conscious Cat Wall Calendar is now available for purchase! Allegra and Ruby spent hours picking out just the right photos, and they made sure that they received equal representation. To my knowledge, this is still the only calendar on the market that exclusively features tortoiseshell cats. Click here for more information and to purchase. This fountain is the perfect gift for your cat or small dog. The fountain is made from high quality material, and features a charcoal filter for clean, pure and healthy water. The Raindrop Fountain is dishwasher safe, and comes in two sizes: 60oz and 96 oz. It is also available in other materials. Visit http://www.PioneerPet.com for more information and to purchase, and be sure to watch for their amazing Black Friday and Cyber Monday deals. Yummy Travel Bowls are a modern and convenient three-in-one pet product that allows a pet owner to store, transport, and serve pet food and water simultaneously, without mixing or spillage of the contents. Yummy Travel Bowls feature a spill resistant water bowl that serves as the base, a food bowl that slips into the water bowl making the water bowl leak- free, and a lid that seals Yummy Travel Bowls making it spill-proof. 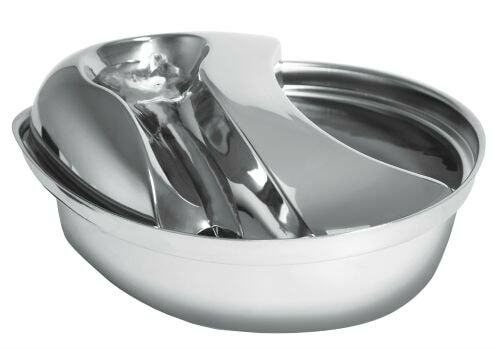 The lid becomes an extra bowl when flipped over, thereby allowing for dry food, wet food, and water to be served in separate bowls. When the Yummy Travel Bowls lid is used as a food bowl, the saucer portion can be filled with water to keep ants out of food. Yummy Travel Bowls are made from baby safe, FDA food grade, BPA-free silicone that is freezer, dishwasher, and microwave safe. 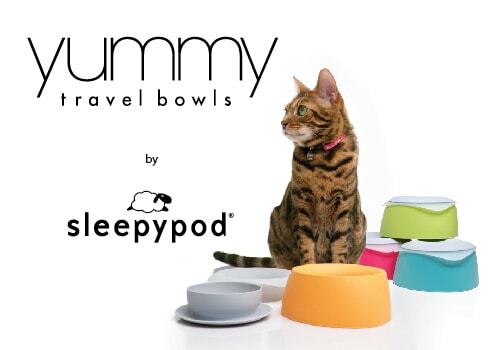 Yummy Travel bowls has been awarded the Dog Fancy Editors’ Choice Award (2011) and the Pet Product News International Editors Choice Award (2011). 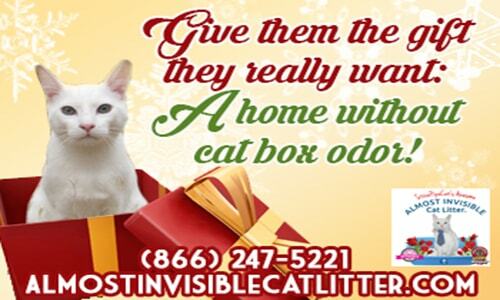 Never smell cat box odor with Almost Invisible Cat Litter. Yes, never! Almost Invisible Cat Litter has finally put an end to the aspect of sharing life with a cat that most cat guardians hate the most: Cat Box Odors. 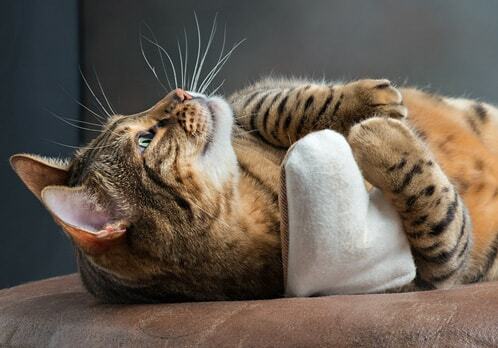 Almost Invisible Cat Litter totally suppresses odor and does so with very low dust and minimal tracking. Almost Invisible Cat Litter is a uniquely formulated high density silica gel that neutralizes the smell of urine in under 30 seconds and quickly dries out solids until the odor barely detectable, even if not burried. With only slightly more than 1” of material in your litter tray, nobody will smell any cat box odors for 22 – 30 days with one cat or 5 – 7 days with 4 cats, etc. Your litterbox always stays dry and without moisture, bacteria cannot grow. Just scoop and stir every day. Almost Invisible Cat Litter has a unique particle size that is slightly larger than sand and cats instictively want to use it. The particles do not stick to paws or fur, even with long haired cats. Particles that get kicked out of the box do not roll, making it as non-tracking as it gets. Never lose your pet again! 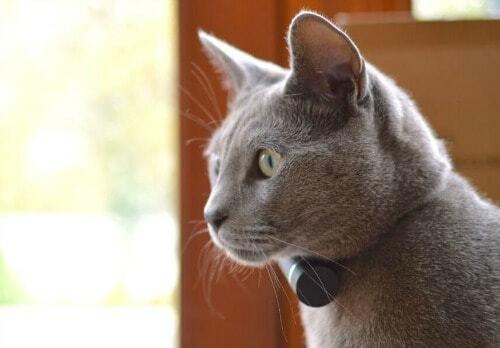 Pod is a sleek little tracking device (about the size of a wine cork), which attaches to your pet’s collar and lets you instantly locate your animal from your phone as well as track their activity and fitness levels. For more information and to purchase, please visit http://www.podtrackers.com. 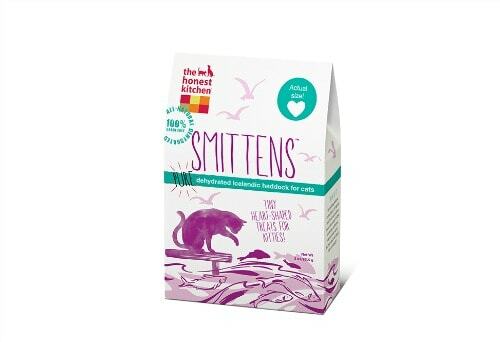 Smittens are single ingredient treats that contain only dehydrated haddock – no fillers, artifical additives, corn, wheat, soy or GMO ingredients. These high protein and low fat treats have just the right amount of crunch, and the 100% pure fish taste cats love. For more information and to purchase, please visit http://www.TheHonestKitchen.com. 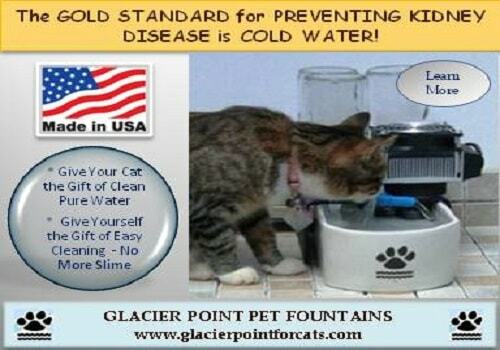 Glacier Point Pet Fountains are the best investment you can make for your cats or other pets. These handmade, ceramic cat drinking fountains are 100% food-safe, and easy to keep clean. All fountains are made in America with American designed parts, non-porous high fired toxin free ceramic bowls, certified water safe antimicrobial fittings, automatic glass refill system and grounded electrical plugs. When kidney disease is a concern, common sense and our research confirm that cold water is the best prevention and therapy. For more information and to purchase, please visit http://www.GlacierPointforCats.com. Exclusive 10% discount for Conscious Cat readers on select fountains: use code ConsciousCat at checkout. Discount expires December 31, 2015. Just Cats Clinic, the only feline exclusive clinic in Reston, VA, is proud to offer an environment catering to cats and their people. American Animal Hospital Association (AAHA) accredited and Gold Standard certified from the American Association of Feline Practitioners, the Just Cats Clinic team is dedicated to helping your cat live beyond nine lives. They offer a wide range of services including routine examinations and vaccinations, disease management, diagnostics including lab work, digital radiographs and dental radiographs, dental cleanings and extractions and domestic/international health certificates. 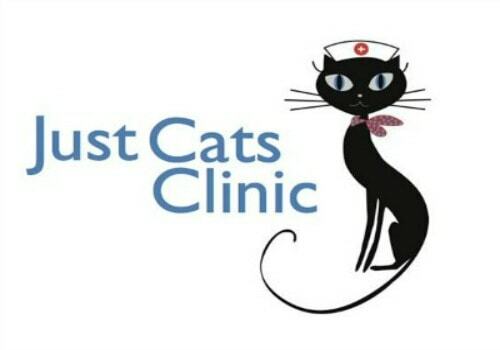 Just Cats Clinic also incorporates less invasive treatments like acupuncture and laser therapy. They offer luxury boarding including large condos with floor to ceiling windows to help keep your kitty entertained while you’re away. Exclusive 20% discount on your first visit for Conscious Cat readers: mention this offer when you make your appointment. Discount off applicable items only, cannot be combined with any other offer or discount. Weruva’s pumpkin supplement is a great source of healthy fiber helping to support your best friend’s digestive system. 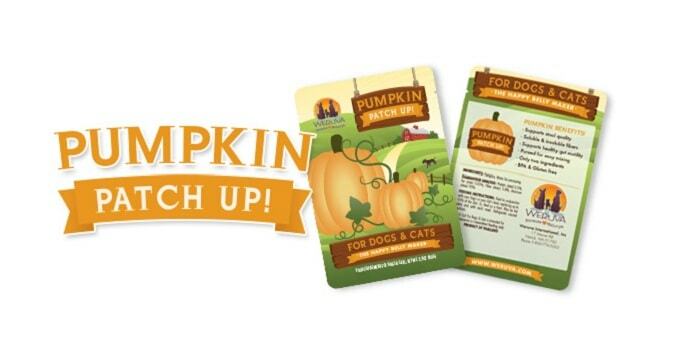 Weruva combines the heathy digestive benefits of pumpkin in an easy to serve pouch. This supplement supports stool quality and healty gut motility with soluble and insoluble fibers. It contains only two ingredients, is BPA and gluten free, and is pureed for easy mixing. Feed in conjunction with your cat’s food, replacing up to 10% of the diet, or feed as a treat. May be fed daily and with each meal. For more information, please visit http://www.weruva.com. This beautiful little volume features gorgeous cat photos alongside excerpts from the Dhammapada, a collection of sayings of the Buddha in verse form and one of the most widely read and best known Buddhist scriptures. Each of the book’s five sections, Mind and Body, Happiness, Virtue, Truth, and Eternity, offer the reader a chance to reflect and meditate. 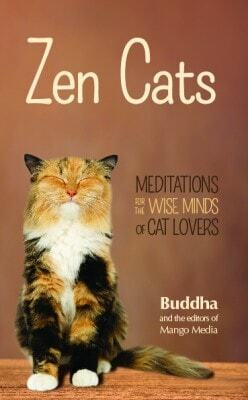 Zen Cats is available from Amazon and everywhere books are sold. Thanks! These are great ideas. It will make shopping much easier this year.